Merriam-Webster is America's foremost publisher of language-related reference works. The company publishes a diverse array of print products. Dictionary making at Merriam-Webster has always been an ongoing process. Even as the 1859 edition was being published, editorial work on a completely new edition was under way. 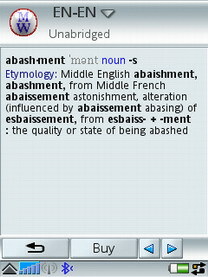 Merriam-Webster for Symbian UIQ 3.0 presents Medical, bilingual and monolingual dictionaries, including Merriam-Webster's Collegiate® Dictionary, Eleventh Edition—America's best-selling desk dictionary—and Webster's Third New International Dictionary, Unabridged. 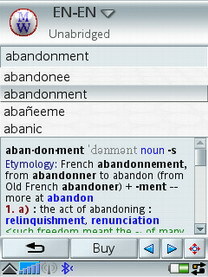 Each SlovoEd software dictionary engine of Epocware/Paragon Software (SHDD) is full of unique features that enable you to use the dictionary on your mobile device. The engine is developed in strict accordance with the design philosophy of Symbian OS platform and compatible with a wide range of modern devices. Two industry leaders have combined their efforts to provide a revolutionary combination of high-quality reference content and state-of-the-art technology for your translation needs.